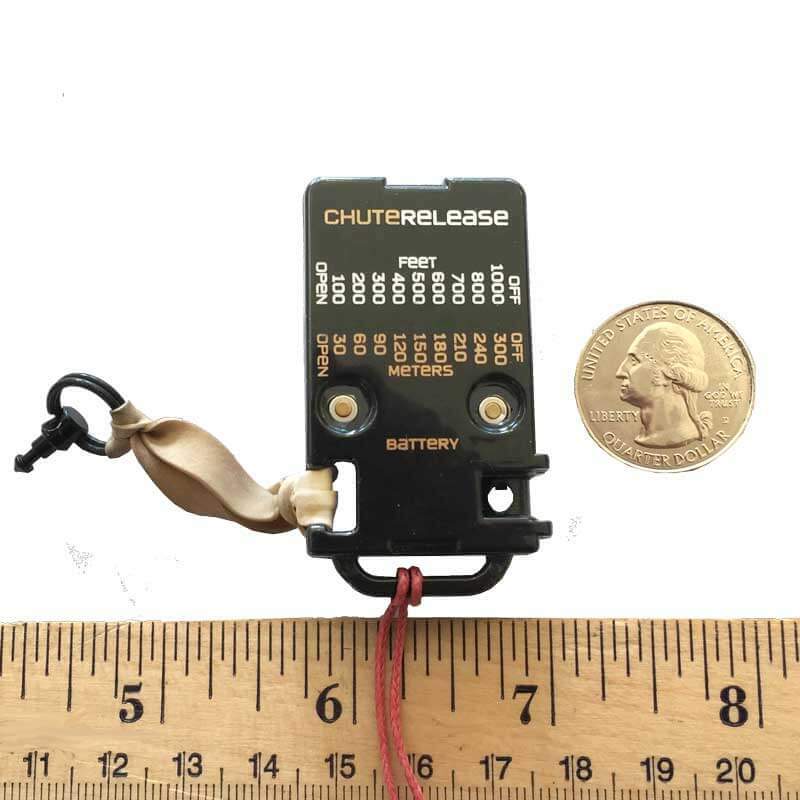 Chute Release is a small electronic device that holds your rocket parachute closed until it drops to an altitude that you choose. This is great for windy days and small fields when normally your rocket would drift too far while descending under parachute. Simply wrap the elastic around your folded parachute and snap it into the other side of the release, then set the altitude from 100 to 1000 feet (30-300 meters) and you are ready for launch. Rocket requirements Requires the use of motor ejection, and enough space for Chute Release and parachute, at least BT-60 1.6″ (41.6mm) diameter tube. May work in some 38mm rockets. Battery Built-in rechargeable battery and USB charging cord included. Chute Release uses an elastic band which wraps around the parachute and has a pin which snaps in place on the other side of Chute Release. Chute Release can sense altitude using a highly accurate atmospheric pressure sensor. When the rocket descends to the chosen altitude, an electronic servo releases the pin and lets the parachute open. Chute Release is powered by a built-in rechargeable battery that can be recharged from any USB port (cable included). Chute Release is constructed of incredibly strong polycarbonate plastic to stand up to ejection charges and impacts. The mechanicals are constructed of precisely-machined aircraft aluminum, Teflon coated so that they need no lubrication. Before launch, you fold your parachute up, attach the tether, and wrap Chute Release’s elastic band around the parachute, clipping the pin into the other side of Chute Release. Your parachute will now stay folded until Chute Release lets it go.